Today King Felipe and Queen Letizia of Spain will be presenting annual Princess Girona Awards. Like every year before award ceremony the royal couple met with the members of the foundation and the previous year’s award winners. The Princess of Girona foundation was established on June 26, 2009 by the Chamber of Commerce of Girona, Caixa Girona, the Gala-Salvador Dalí Foundation and “la Caixa” in the honour of Prince of Girona – title hold by the heir apparent of the Spanish Throne, the then Prince Felipe. After his proclamation as King the title went to Princess Leonor, hence the foundation name changes to Princess of Girona Foundation. The Princess of Girona Foundation aims to become a global platform and a benchmark for the promotion of progress and talent, through projects where the real protagonists are young people, whatever their age and scope (business, social, cultural, sports, academic or scientific). The Princess of Girona Foundation understands the support for young people as a way to enhance the capacity of the new generations in the construction of a better and more solidarity society, with special attention to young people from more disadvantaged backgrounds. The activities of the Foundation are structured around four main lines: the promotion of entrepreneurial initiative, the school success of the youngest, the improvement of employ ability and the promotion of vocations, with a special interest in the detection of young people with talent that can become contemporary referents of other young people (FPdGi Awards), the launch of programs to improve employability (program “Rescuers of talent”) and educational innovation in the training of trainers (“Educate entrepreneurial talent” ). 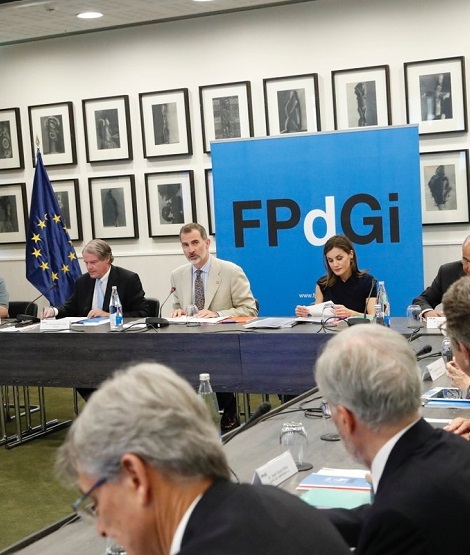 In 2017, the FPdGi will allocate 2.8 million euros to programs for the benefit of young people. These awards are awarded in five categories: four individual awards to young people (between 16 and 35 years old) who undertake and start a work, a business, an endeavor, especially if they entail difficulty or risk, and with this they are capable of inducing creatively positive changes in society, and an entity that works in favor of young people, especially in the promotion of entrepreneurship, employ ability and employment, education and school success, vocation and talent. Later on their Majesties presided over the XVIII meeting of the Board of Trustees of the Princess of Girona Foundation. In the evening, King and Queen will deliver the awards to the winners of this year’s edition at Celler de Can Roca Event Center in Girona. For the first part of the day, Queen Letizia kept her look simple and youthful. She was wearing her Boss Viplisa skirt that she debuted in November last year when the Royals welcomed Palestine President to Royal Palace. 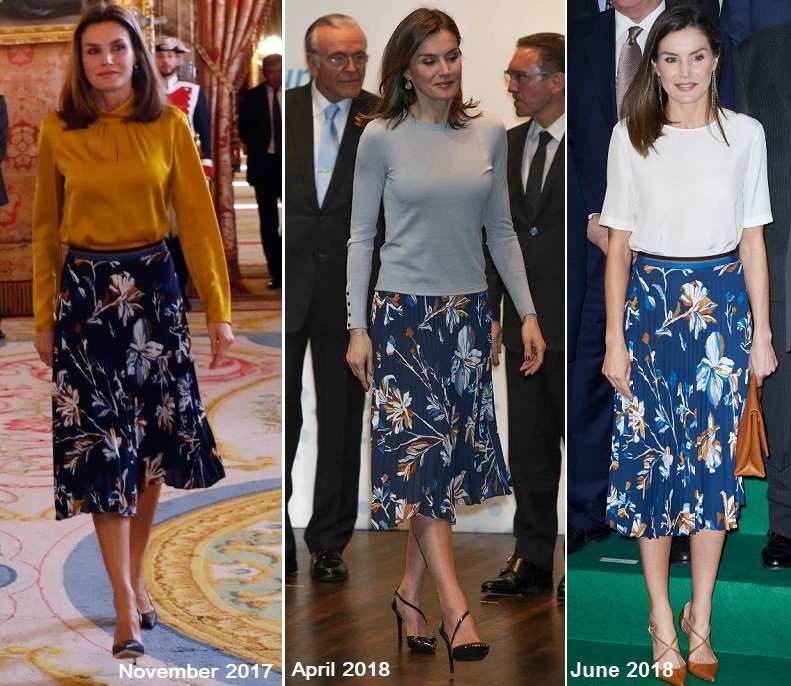 Letizia has worn the skirt with different styles since then. 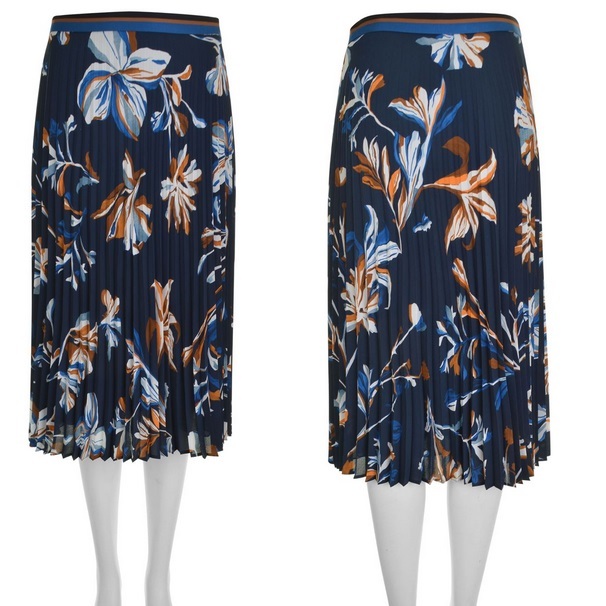 Today she teamed up the skirt with blue Light Cotton Top from Nina Ricci. 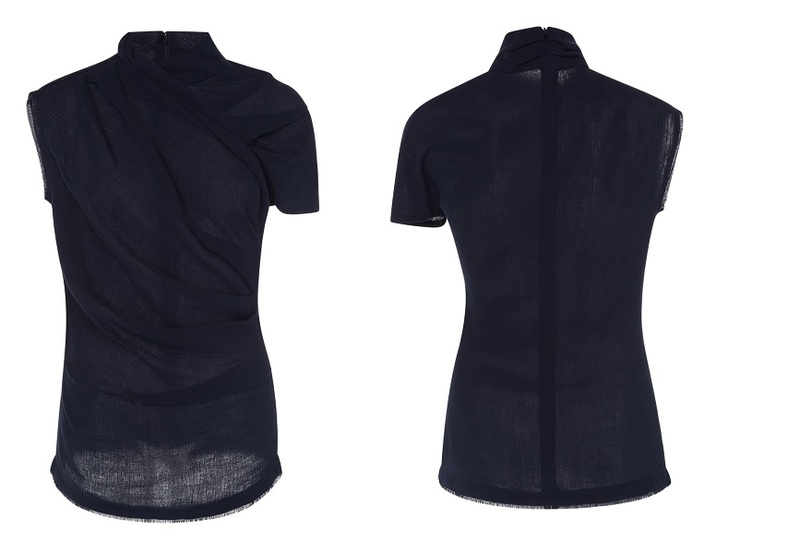 The already sold out top from label’s Spring summer 2018 collection features a draped bodice with single sleeve, frayed hem and back zip closure. Letizia paired the outfit with Magrit animal printed python Pumps that she premiered in this April when the couple received Portuguese president at the palace. Her TOUS blue hydrothermal quartz and amber earrings finished the simple chic look of the day. She looks amazing. Her style is chic amd youthful. I love that skirt.